With 30,000 copies sold and now available in paperback for the first time with a new cover, here is a flavorful collection of more than 250 recipes representing all the major ethnic cuisines of the state from Texas’s official travel magazine, Texas Highways. Whether you're hungry for down-home barbecue and Tex-Mex, or you want to try more exotic dishes such as Paella Valenciana and Thai Pesto, Texas Highways has long been a trusted source for delicious recipes that reflect wide-ranging Lone Star tastes. The state's official travel magazine published its first Texas Highways Cookbook , which has sold 20,000 copies, in 1986. Responding to the public's demand for a new collection of the magazine's recipes, the editors are pleased to bring you Cooking with Texas Highways , a compilation of more than 250 recipes that are as richly diverse and flavorful as Texas itself. 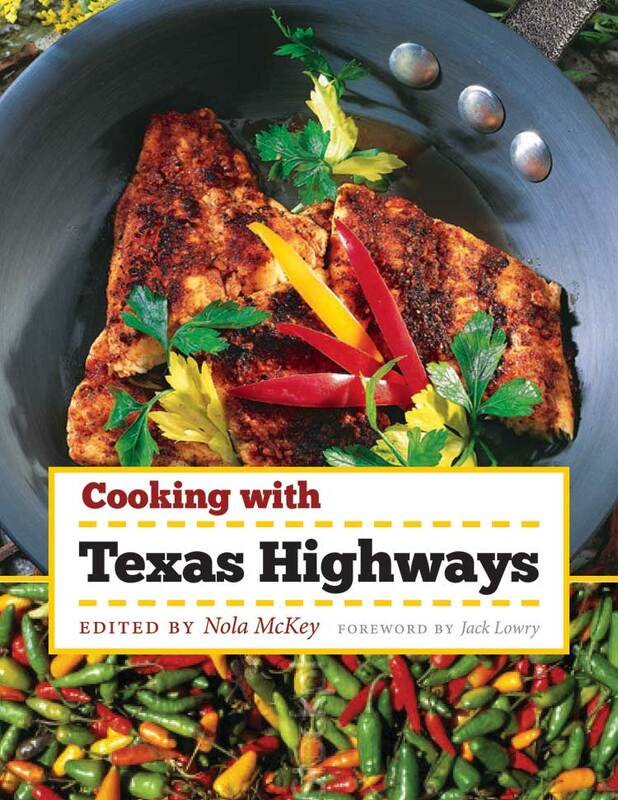 Cooking with Texas Highways samples all the major ethnic cuisines of the state with recipes from home cooks, well-known chefs, and popular restaurants. It offers a varied and intriguing selection of snacks and beverages, breads, soups and salads, main dishes, vegetables and sides, sauces and spreads, desserts, and more. A special feature of this cookbook is a chapter on Dutch-oven cooking, which covers all the basics for cooking outdoors with live coals, including seventeen mouth-watering recipes. In addition, you'll find dozens of the lovely color photographs that have long made Texas Highways such a feast for the eyes, along with tips on cooking techniques and sources for ingredients and stories about some of the folks who created the recipes. If you want to sample all the tastes of Texas, there's no better place to start than Cooking with Texas Highways . Nola McKey has been an Associate Editor at Texas Highways since 1994. Previously she was an Assistant Foods Editor at Southern Living . Jack Lowry has been the Editor of Texas Highways since 1992. As a travel magazine, Texas Highways has never claimed to be in the same culinary league as Gourmet or Bon Appétit , but you can't travel the state for more than three decades, as we have, without picking up a few good recipes. Texas abounds with great cooks, from Dutch-oven masters to trend-setting restaurateurs, and over the years, many of them have shared their favorite recipes with us. Now, we'd like to share our collection with you. The roundup includes Lone Star classics like chicken-fried steak and chili, as well as exotic fare like tabouli and Thai Pesto. The mixture is as diverse as Texas, and just as flavorful. Many of our recipes rely on the state's wealth of fruits and vegetables, meats, freshwater fish, and seafood. Others take their cues from the cultural traditions of other lands—Texas has representatives from scores of ethnic groups. As you might expect, the combining of such varied resources makes for some exciting concoctions. Looking for a new spin on beef stew? We've got it. How about a recipe for blackened catfish? We've got that, too. Tex-Mex? You know it. Vegetables? The list includes traditional favorites like fried green tomatoes, as well as entrées like Spinach-Mushroom Lasagna and Grilled Portobellos. Desserts? Whatever suits your fancy, from kolaches to Nopalito Pie. No, we can't offer you the only cookbook you'll ever need, but we can offer you a gastronomic tour of the state. Along the way, you can enjoy our signature photography—magnificent scenes of fields and forests, roadsides and rivers, and more, from the Panhandle to the Gulf Coast. So come on, roll up your sleeves, find an apron, and start cooking with Texas Highways . When the term Dutch oven comes up in most recipes, it's usually in reference to a large, deep pot with handles on both sides and a domed lid. However, in this section, it refers to the original Dutch oven (sometimes called a camp oven), a heavy cast-iron pot that sits on three legs and has a flanged lid for holding hot coals. Why a special section on Dutch-oven dishes? Two reasons. One, because there are so many Dutch-oven enthusiasts in Texas. The Lone Star Dutch Oven Society is one of the largest societies in the world, with more than a dozen chapters scattered across the state. (At one point, the organization even had a member in Japan.) Chuck-wagon cooking groups also abound, and, of course, use the same venerable black pots. Charles Goodnight, who invented the chuck wagon, supposedly took one along on Texas' first trail drive. Of course, you don't have to belong to any special group to enjoy Dutch-oven cooking. Which brings us to the second reason we decided to include this category: Dutchin', as it's affectionately called, goes hand-in-hand with Texans' love of the outdoors. Campers discovered the versatility of this durable container long ago. You can use it for baking and roasting, just like a conventional oven. You can also use it as a stewpot, a frying pan, a deep fryer, a slow-cooker, or a steamer. If that list sounds like a stretch, see our recipe for Black Forest Icebox Pie, made in—what else?—a Dutch oven. Some of our other recipes may also surprise you. Check out Nutty Chicken and Sassy Meat Loaf Ring, for example, entrées with unusual flavor combinations. And Brie with Toasted Pecans is downright elegant, even if it is made in a plain-jane pot. We've also included some of the old standards, from pan de campo (camp bread) and vinegar cobbler to a recipe for sourdough starter, which you can use to make both sourdough biscuits and sourdough flapjacks. What to do with your extra starter? Give some to a friend and introduce that person to the art of Dutch-oven cooking. It's a passion easily shared. But be sure to give fair warning: Once bitten by the black-pot bug, you're usually hooked for life. As the name suggests, this salsa is bright green, thanks to a flavorful combination of tomatillos, serranos, and cilantro. Place tomatillos in a saucepan, cover with water, and bring to a boil. Simmer gently, uncovered, about 15 minutes or until tomatillos are soft. Turn off heat and allow tomatillos to cool in the cooking water. Combine remaining ingredients in a food processor or blender and purée. Drain tomatillos, add to mixture, and purée. Store in refrigerator (will keep about a week). Yield: 2 1/2 cups. Anyone can throw a few tea bags into a pot of boiling water and come up with the base for a decent iced tea. But making a perfect pitcher of the amber-colored beverage time after time requires a bit more finesse. First of all, forget the boiling water. If you heat a pot of water for tea and it boils, throw the water out and start over. Remember sun tea? One of the reasons it was so good was that the water never boiled. Today, the tea industry discourages making sun tea because of concerns about bacterial growth during the long brewing period. Assuming you don't have half a day to make tea anyway, here's a method that works just as well. Place 3 tea bags in a saucepan, add a small amount of water, heat until you see steam rising, and then turn off the heat. Cover and let steep about 10 minutes. Meanwhile, put a cup or two of cold water in a 2-quart glass pitcher (to prevent the pitcher from breaking when you add the hot liquid later). If you want sweet tea, this is when you add the sugar. A cup of sugar per pitcher was once the norm for many Texans, but these days, most folks think that's excessive and use somewhere between one-fourth and one-half cup. After the tea has steeped, remove the tea bags and pour the liquid into the pitcher, stirring until the sugar has dissolved. Stir in additional water until the tea reaches the desired strength. Serve over ice—lots of ice—in tall glasses. Lemon slices and fresh mint optional. Experienced Dutchers often keep a spray bottle of vegetable oil handy; it works like no-stick cooking spray and is less expensive. Preheat a 12-inch Dutch oven over a full spread of hot briquettes. Spray inside of oven with vegetable oil or no-stick cooking spray. Brown sausage, breaking it into small bits. Stir in onion and tomato; cook until onion is translucent. Remove sausage mixture and drain on paper towels. Add hash browns to Dutch oven; fry until golden brown, stirring constantly. Add drained sausage mixture and mix well. Pour beaten eggs over sausage mixture and place lid on oven. Remove briquettes from the bottom, placing them on top of the lid, until you have 1 ring; add enough fresh hot briquettes to make 1 1/2 rings total on top of the lid. Cook 8 to 10 minutes or until eggs are almost set. Sprinkle cheese on top and continue cooking until eggs are set and cheese is melted. Spread salsa on top, garnish with avocado slices, if desired, and serve. Yield: 6 to 8 servings.